When I try to imagine the most sinful and delicious dish in the world, cheese fries is one of the creations that comes to mind. 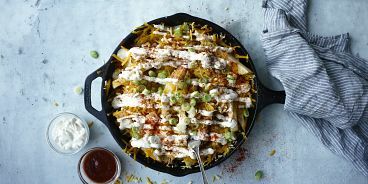 Greasy potatoes loaded with cheese, mayo and other indulgent toppings…it rarely gets crazier than this. But, if you’re like me, a dish this indulgent may result in a food hangover that’s just as intense as the pleasure it provided. So, why not lighten things up just a bit? 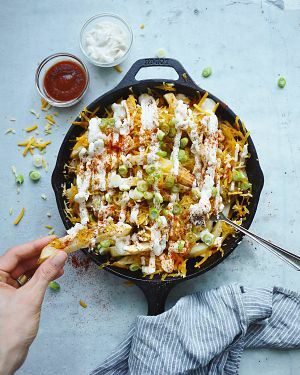 Here’s a recipe for Cheese Fries that’s baked (not fried) and calls for new Hellman’s Carefully Crafted Mayonnaise, a spread that’s free of cholesterol, eggs and GMOs. For the record, I’m thrilled that this new product has hit store shelves, making vegan mayo accessible to so many more shoppers. Once you try it, I bet you’ll agree there’s no good reason to buy conventional versions. It’s thick, creamy and tangy, just like the kind you might be used to. Preheat your oven to 400F and line two baking sheets with parchment paper. Chop your potatoes into mediums-sized ‘fry-like’ strips and divide them evenly onto your baking sheets. Sprinkle each sheet of potatoes evenly with garlic, olive oil, Mexican chili powder, paprika, salt and pepper. Toss to evenly coat your fries. Try to ensure your fries have enough space on the baking sheet — if they are touching they will turn out less crispy, more soggy. Bake for about 35 minutes or until golden. At the 20 minute mark, take a peek and give them a flip. When done, remove from oven and add a third of your fries to a large iron skillet. Sprinkle with vegan cheese. Add another ⅓ of your fries, now add more cheese. Repeat this step one more time and place skillet back in oven so the cheese can melt (about 10 minutes). Once cheese is melted, remove from oven and garnish with a generous drizzle of Hellman’s Carefully Crafted egg-free mayonnaise, a handful of chopped green onions, another sprinkle of Mexican chili powder, salt and, if your taste buds are like mine, a major sprinkle of malt vinegar.